"I've been waiting for you for over a hundred years," sighed the young girl by the side of the road. A passing peddler paused to scratch his head, eyed the pretty girl, then laughed at the cryptic remark. "Why don't you come to Kyoto with me then, if that's the case," he called. "I'll be selling my wares at the Emperor's Court, perhaps we might find something for you there." So on they traveled together for many days along the Tokaido roadway to Kyoto. Traveling day and night, he marveled that she was never tired or afraid. 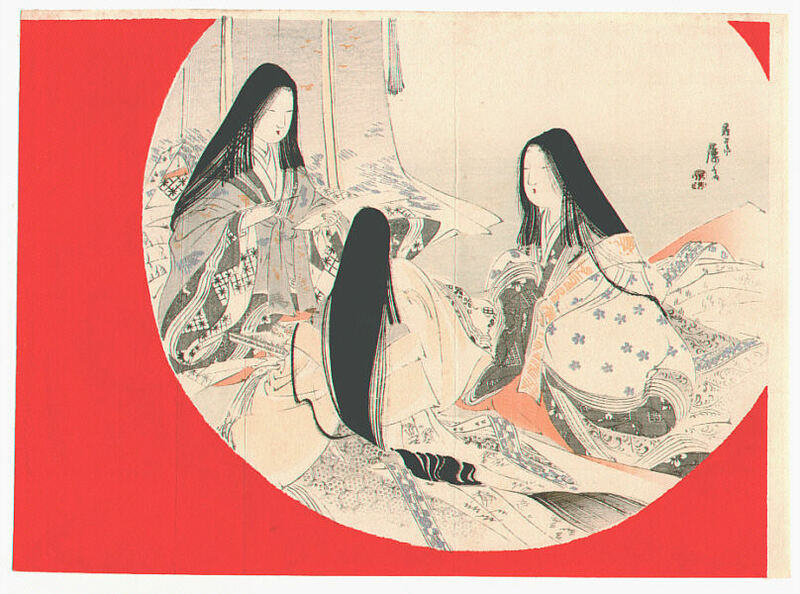 In Kyoto, the peddler sold his fine wares to the ladies of the court. Amidst their merriment one lady remarked on the graceful appearance of the young girl and asked her to entertain them with some dancing. The young girl obliged them with the most elegant performance they had ever seen. So delighted were the ladies that the Emperor himself called for a special performance of the dance. And so she danced again and to His Augustness it seemed as if she was the foam upon the waves. "Tell me", asked the Emperor,"what favour can I grant you in return for this beautiful gift?" The girl was silent with eyes averted as if she were overwhelmed. "Do not be afraid, ask of me anything at all." "Anything?" ventured the girl in a small voice. "Of course, please just ask." "Then...if it pleases you... let me stay here in the residence of Your Radiance." And so it was that the girl was accepted into the Emperor's household. 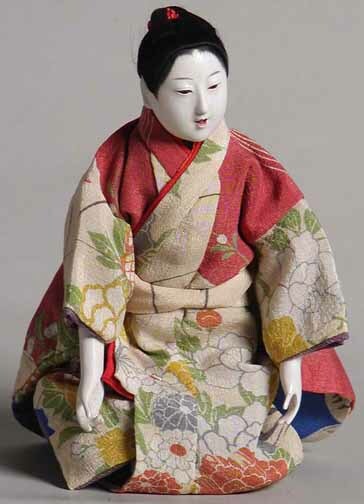 Within a few years the girl grew into the most refined of ladies, accomplished in every lovely art; at the koto there was none to match her sensitive touch, the tracings of her brush were cherished and kept in sandalwood boxes, her knowledge of the Classics was enviable. There was not one art that escaped her perfection. She became known as the Jewel without Flaw - and the Emperor's favourite. As the years past the Emperors temper became increasingly strange, listless at times more querulous at others till the state of the court was nervous and brittle. But still he would favour Tamamo and became bright and gay while she was with him. So careless did he become that for the occasion of her thirty-seventh year he commanded a great banquet to be held in the Summer Palace in her honour. His wise councilors advised him of the dangers of such an inauspicious occasion, but the Emperor heeded them not sending them violently away. Gathered together the whole court proceeded to dine and feast, wine cup after wine cup. Giddy with pleasure the Emperor openly declared, "Tamamo, there's not a woman in the world who is fit to touch your sleeve!" At that very moment there was a clap of horrendous thunder so loud that it pierced the ear - the Emperor collapsed as one struck by lightening! Black boiling clouds rose up out of nowhere and the day became as night. The Court was panic stricken, ladies screamed and men ran pell mell over tipping the feast and up turning furniture. The red and gold clad Tamamo was as an unearthly statue and from her body their came a ghostly fire. The Emperor remained as one asleep from that time and the wise men of the Court were very worried. They decided that they should call on the assistance of Abe Yasu, the Diviner.
" Merry wine sinks with a leaden head. Vices are illusions web; deception wears desire's mask." "What can that mean?" 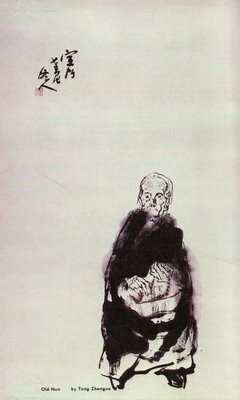 the wise men questioned Abe Yasu. "Please explain the meaning of what you say for we are in sorry need of aid." "I will help you but first I must fast for three days, return to me then and we will save His Augustness." When the wise men returned they found Abe waiting for them. The Diviner took the Sacred Gohei from its place in the Shrine - blessing each of them with a touch of the Gohei. Abe Yasu and the wise men proceeded to the Palace and asked for an audience with Tamamo. Tamamo was in her bower with her maidens. "What could they want with me?" she asked the attendant who delivered the message. "They wish you to here a poem, My Lady." "It is a strange time for poetry, tell them to go away." But the wise men and the Diviner insisted saying they would not leave until she had given them an audience. So she finally consented and Abe Yasu coming forward spoke to Tamamo though the screen. "My Lady please come a bit closer, I am an old man and my voice is feeble." Tamamo drew very near to the curtain so that her fair hand revealed itself. "What is this poem you speak of?" Merry wine sinks with a leaden head. And with that he touched the Scared Gohei to Tamamo's hand. Her hand withdrew with a terrible cry of pain. The curtains blew out and a golden fox with nine tails flew out from the bower and away. Far, far it few until it came to the plain of Nasu, where it hid itself beneath a large black stone that stood in the plain. The Emperor was said to have recovered the very day Tamamo disappeared. There soon came stories of the Black Stone on Nasu plain; that there flowed from it a poison steam, any who drank from it whether bird, beast or man, sickened and died. People were said to have passed away just from sitting in its shade and birds flying over the stone were said to have dropped from the sky. It became know as the Black Stone of Death for over a hundred years. The wheel of fate turned and so it was that a High Priest named Genyo - a special holy man, was traveling through Nasu on a pilgrimage. The villagers kindly filled his begging bowl with rice and vegetarian food. They also warned him of the Black Stone of Death. "Do not rest near the Black Stone," they said. "For its poison is ancient and evil." The priest thoughtfully thanked the villagers for their care but reminded them, "the Book of the Good Law tells us that even the herbs, trees and rocks shall enter into Nirvana." Instead of avoiding the Stone, Genyo made his way towards it. On arriving there he set up incense and recited scriptures. After many hours when the sun was dipping low on the western horizon Genyo picked up his staff, striking the Black Stone he cried, "Spirit of the Black Stone of Death, Come out!" "I am Tamamo, once called the Jewel without Flaw. 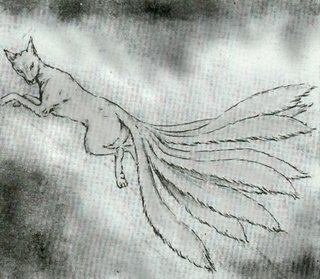 I am the golden fox spirit, who has lived for over two thousand years. I have the knowledge of all magic and I have been worshiped by nations and by men. But love has changed me and I have passed these hundred years weeping in bitter grief. Please holy man strike me down so that I may be eased of this terrible pain." "No, poor spirit, I shall not kill you." Genyo removed his priests robes and wrapped them around the fox spirit. He gave her his begging bowl and his prayer beads saying, "go instead upon the long journey of enlightenment." Tamamo gave a small wan smile before vanishing never to be seen of again. "O Buddha Tathagata and merciful Bodhisattva Kwannon, may she be reborn upon the path of Devotion." It feels quite special to have been to the very place and seen the very stone the legend is talking about. And even though in the end Tamamo No Mae enters the path of enlightenment, we never know whether she really reached it or eventually returned to her cursed stone. The night we spent next to the stone surely felt like the second outcome, but then: We are still alive. In any way thanks to Florence for letting me share this!